Middle row, fifth from the right. I think that’s Doug Ault. It’s the only trace I have of him in my collection besides his name on the back of this card. It’s one of the few names with a blank box next to it. 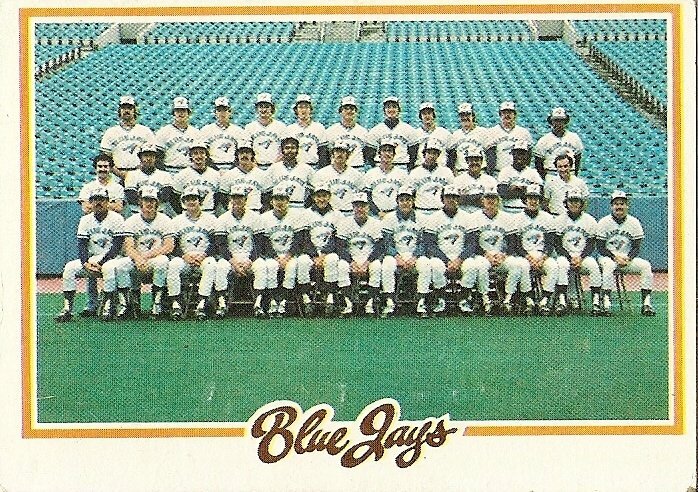 As the summer of 1978 went on and all the other boxes on the back of this card started to fill, I must have begun dwelling on Doug Ault’s name and the empty box next to it. Four years ago this Monday, Doug Ault left a note for his wife in their kitchen. It’s the kind of note you never want to find. If my brother didn’t have doubles of a Doug Ault card that I could try to trade for, then the only other method I could employ to try to fill in the box next to Doug Ault’s name was to wish for him, to believe that he existed even though I couldn’t see him, to believe he somehow knew he was needed, to believe he was somehow being pulled in the direction of that need, to the middle of nowhere where I was. Doug Ault was the first Toronto Blue Jay to homer, doing so in the first inning of the team’s inaugural game. Two innings later, he hit the second home run in franchise history. What must it have felt like to connect that second time? Ault had played a few homerless games in the major leagues the year before, with the Texas Rangers, but they’d left him unprotected for the expansion draft. After his Opening Day barrage, he would hit only fifteen more home runs in his career and be out of the majors by 1980. But forget what came before and what followed. Doug Ault is rounding the bases, a member of a team that had not even existed the year before, that had come into existence wanting him, naming his name in the expansion draft, and he’d hit two home runs in his first two at-bats. His whole body must have been buzzing as he rounded first, then second, then third, as he reveled in the roar, as he stomped on the plate. Here I am, motherfuckers! Doug Ault! Home! Why did I wish for cards I didn’t have when I was a kid? Why do I hold on so tightly even now, thirty years later, to the cards that I do have? I don’t really know. But I know there are good moments, moments of connection, moments of feeling at home in this world. I also know there are moments that aren’t even moments but empty boxes next to your name. The emptiness within the borders of that box is bottomless. You feel your name being pulled toward it. You feel like you don’t have the strength to fight the pull. If you have something, anything, to hold on to, hold on. 1. Interesting story you linked. I missed the news on Doug Ault the first time around but was reading about the death of Nick Willhite this week. Like Ault he’d fallen into depression and substance abuse following his career. Fortunately the help he got from the BAT cleaned him up. 2. Great link, sad story. I remember those home runs like yesterday. It is always quite exciting to see a new franchise get started, makes me wonder what Coco Laboy is upto these days. 3. Direct all thanks to Ennui Willie Keeler for the link. 5. Dock Ellis just died, too. Josh, I hope you have one of his cards. You could write for a while about him. I remember Doug Ault batted right and threw left-which happens to be the worst combination in baseball. I knew a kid who did that in high school and later on he was busted for auto theft.